Looking for puzzler apps that are tough yet addictive? 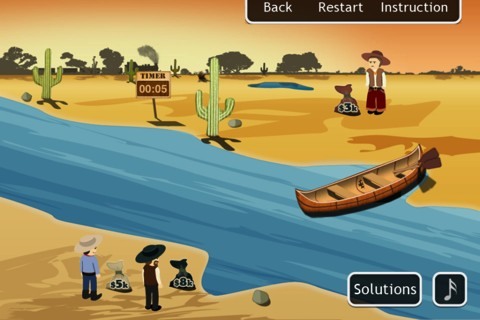 The River Tests by SolverLabs strives to test your puzzle solving abilities on the iPhone & iPad. River Tests originate from Japan where they are given as IQ tests during job interviews. Estimates show that only 10 percent of people can complete all the tests in the allotted amount of time. The River Tests iPhone app comes with five tests to challenge your brain. The first test (3 Soldiers) comes with three soldiers and two children. Only one soldier or two children can cross at a time. A soldier and a child cannot pass at the same time. You need to get all five people to the other side of the river. The second test (3 Jealous Husbands) comes with three husband/wife sets. Only two people can pass at one time. No wife can be left with a strange man who isn’t her husband. The third test (The Nuggets) revolves around three prospectors and their bags of gold. All three need to get across the river with their bags of gold. No prospector can carry a bag of gold worth more than their own bag of gold. The fourth test (4 Jealous Husbands) comes with four husband/wife sets. Only two people can pass at one time. No wife can be left with a strange man who isn’t her husband. The fifth test (Original) comes with one family with four children, a thief and a police officer. The father cannot be left alone with the daughters. The mother cannot be left alone with the sons. The thief must remain with the policeman. The River Tests comes with a high score to monitor how fast you completed each test. At the top of the screen are the instructions and the restart button. At the bottom of the screen you turn off the sound and see the solution. The graphics in The River Tests are very basic. Nothing outstanding about the graphics. You move people by tapping them. This automatically moves them to and from the boat. If your solution results in an improper move, the screen shows why you cannot move those two individuals. The River Tests works on the iPhone and the iPod Touch. At present, it only comes with five levels. Once you complete a level there really is no reason to return to it since you know the solution. This limits the usage and entertainment value of this application. The River Tests game is entertaining for awhile but unless this app is frequently updated it really has no value to your iOS device. Once you complete the levels, you are done with the game. If you need help you can pay for solution packs via in-app purchases. This review of The River Tests was completed on an iPhone 4. 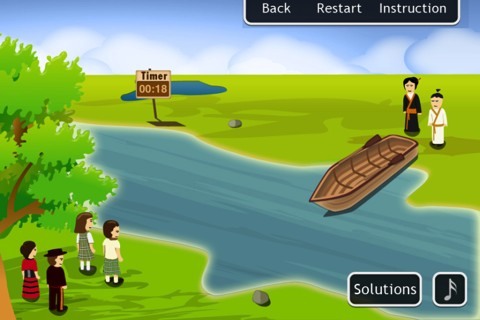 AppSafari review of The River Tests was written by Darius Reimm on April 5th, 2012 and categorized under App Store, Games, iPad apps, Puzzler, Universal. Page viewed 4396 times, 3 so far today. Need help on using these apps? Please read the Help Page.